The Montserrat mountain is one of Barcelona's most popular day trips and is a great way to escape the city and see Catalonia's rolling landscape. What's more, you can combine your trip with a visit to Colonia Guell, probably Barcelona's most underrated day trip, to truly get the most out of your day. Visitors of Montserrat can expect a day full of adventure climbing or hike its craggy cliffs or take the rack railway to the top, and culture enthusiasts can even visit the Benedictine monastery Santa Maria de Montserrat high up on the mountain. Located just 38 miles northeast of Barcelona, typical travel time to the base of Montserrat on public transit takes anywhere between one to two hours, depending on wait time at the cable car. You should try to leave Barcelona as early as possible, though, to avoid the lines and crowds that begin to accumulate around midday. Which Train Do I Need to Get to Montserrat from Barcelona? In Barcelona, you'll want to make your way to the R5 train at Plaça de Espanya station; fortunately, there are signs all over the station pointing you "To Montserrat," so you shouldn't have trouble finding the platform. At any metro station in Barcelona, you should buy a ticket that either includes the rack railway or the cable car, or you can also get a ticket called the Tot Montserrat, which includes all transport, lunch, and the museum. The TransMontserrat is similar but just gives you the transport between Barcelona and Montserrat. Which station you need to get off it depends on how you want to get to Montserrat. For the rack railway, get off at Monistrol de Montserrat. For the cable car, get off at Montserrat Aeri. Allowing for the usual extra half an hour for the cable car or rack railway (including transfer time) means you'll spend an hour and a half total in transit from Barcelona to Montserrat. 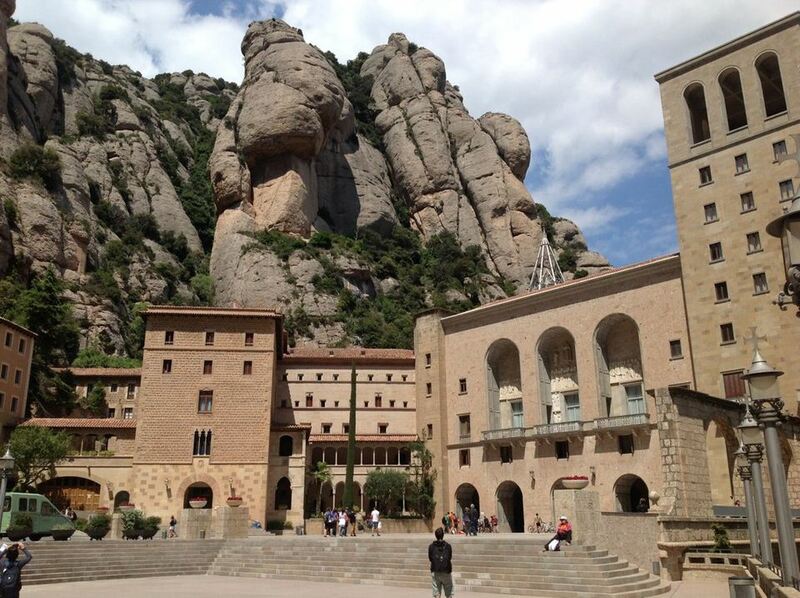 Montserrat is just an hour or so outside of Barcelona, making it an easy day trip from Barcelona (or even a half day). However, there are two good reasons why you might want to take a guided tour instead of making your own way, namely to avoid the hassle of making the connections and to combine your trip with a visit to another nearby site. The train from Barcelona only gets you to the cable car or rack railway that takes you up to Montserrat itself, and trains back are only once per hour, so you have to always keep an eye on your watch if you want to catch the right train or cable car back to make the connection. Additionally, taking a guided tour of Montserrat or traveling by car allows you to combine a Montserrat day trip with a visit to Park Guell, Colonia Guell, or the Montserrat and a Cava Winery. While on the mountain itself, there are also a number of great attractions and beautiful vistas to take in while venturing up to the most striking landmark on the road inland from Barcelona. Montserrat is just as bizarre up close as it is from afar, with naturally formed rock pillars littered along your route to the top, and the rack railway up the mountain provides plenty of fantastic views of this varied landscape. Additionally, Montserrat is home to the Santa Maria de Montserrat abbey, several caves, the municipality of Monistrol de Montserrat, and Santa Cova—a shrine and chapel lower on the mountain from the main abbey. Montserrat is known as the spiritual retreat destination of Catalonia so make sure to stop by the Basilica inside Santa Maria Abbey, which houses an extensive museum of religious artifacts from Spain's illustrious past.